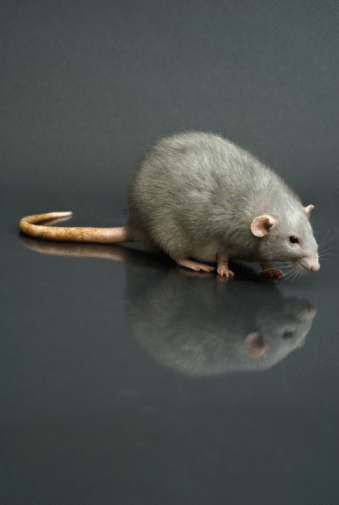 Roof rats (Rattus rattus) have a long and storied history as pests and vectors of diseases like the bubonic plague. They are extremely agile creatures, according to the University of Nebraska Lincoln, as well as prolific breeders, producing three or more litters of five to eight pups, annually. Discouraging roof rats with noise, artificial snakes, birds and cats, or scent repellents will not work. If you want to keep roof rats out of your gutters, you'll have to attack the problem from several angles. Roof rats are very agile creatures. Install wire gutter screens on all your gutters. Lean a ladder of appropriate length against the gutter. Climb it and lay the wire screens on top of the gutter. Secure them with the metal clips that come with your purchase. Drill small holes in the perimeter of downspout openings with an electric drill. Cut circular pieces of leftover gutter screening to cover downspout openings and secure them with wire plant ties poked through the holes and the screen and twisted tight. Prune back all vegetation and tree branches that overhang the roof or come within 8 feet of the house with pole-handled pruning shears and a pruning saw. Rats climb trees and they can jump long distances. Install plastic utility line baffles on telephone, cable and power lines to keep rats from gaining access to your roof. Rats are excellent tightrope walkers and can also be seen creeping along the tops of fences at night. Secure the tops of garbage cans with bungee cords to keep garbage from attracting rats, raccoons, and stray animals. Keep garbage in an enclosed space until the morning of pickup to further discourage rats.